This Software Problem Report is included in editable Word format that can be customized in Word or by using the included Wizard software. Reported By signator, authorized signature or signer. Software Version Environment Operating System Y/N: Windows Release. Problem Description Please describe the problem in as much detail as possible. Make note of any behaviors you observe, whether you can reproduce the problem, and any observations of system behavior, slowdown or other events taking place prior to the instance of the problem encountered. Describe any specific actions you were performing prior to the problem. Frequency Y/N: Problem occurs each time. Y/N: Problem occurs occasionally performing a specific action. Reproduction Y/N: Problem can be reproduced. Y/N: Problem cannot be reproduced. Describe any specific steps or actions to take to reproduce the problem. Severity Y/N: Does not affect usability. Y/N: Minor, requires some extra work to get around. Y/N: Major, requires significant extra work to get around. Y/N: Critical, software is unusable in current state. 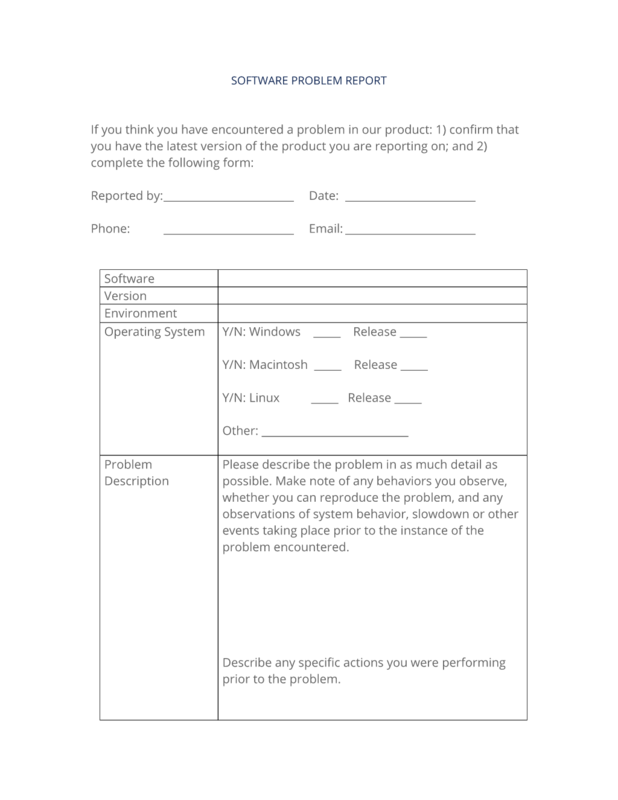 The complete Software Problem Report - with the actual formatting and layout - is available in this Contract Pack.